I ordered a whole bunch of new heels recently and they just arrived! Wheeeee! I hadn’t bought any new ones since I got my first few pairs a year and a half ago, not even when the straps from one of them snapped off and broke. So it totally felt like christmas when the Fedex guy walked in! You have no idea how much effort it took not to jump around him! How did I ever live without these in my life…? 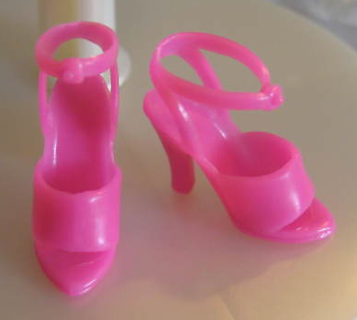 Finally, Barbie doll shoes that fit! But here’s the best part: I’m lucky enough to be getting an amazing tax rebate of a few hundred bucks from the government (seriously!) on the 1st of August, which means that my stripper heels are technically a present from the government! Now aint that sweet?! And come on, if you were surprised with a sudden unexpected windfall out of the blue, wouldn’t you immediately spend it all on shoes as well??! This entry was posted in I'm just saying.., Mad Crushes and tagged Barbie, Pleaser boots, Pleaser shoes, pole dancing, Shoes. Bookmark the permalink. Now I will always know you as the pole-dancing Barbie. With the long hair, super skinny frame, and PINK BARBIE SHOES. If anyone asks you to describe your dance style now just say “Barbie style”. WOOHOO! I love the pink Barbie doll shoes. I might have to find myself a pair. Wow to the boots!! How do you go dancing in them?? Please tell me you’ve tried!